There are two new enhancements to DataTrace® System (DTS), Plat List – Verify Full Legal and the availability of the Arizona Starter Xchange™, to help make your title research and production more thorough and efficient. Users can now select one or more Subdivided legal descriptions from Plat List details and add to Subdivided input screen to be searched. If multiple legals are selected, the entire legal for all selected legal(s) will be added as individual search parameters in the search list. 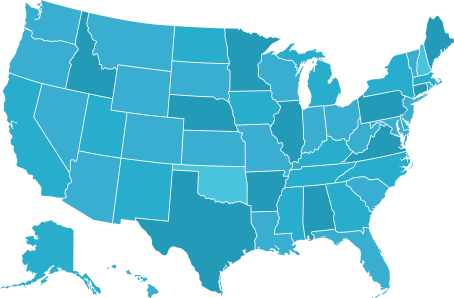 *Plat List – Verify Full Legal are available in ATS only. It will coming soon to TT. DataTrace® has added an exciting new service to the DTS application in Arizona - the Starter Xchange™. 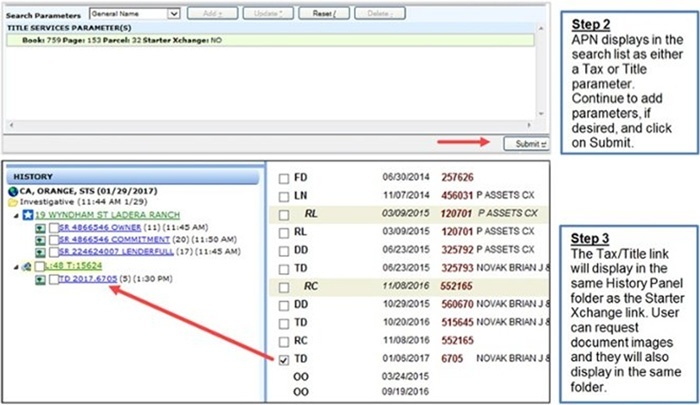 The new Starter Xchange service will provide users with the ability to search a DataTrace starter database for starter images available for the searched property. All available starters for the searched and surrounding properties will display on a map so users can quickly find their Starter. The results section will provide a snapshot of pertinent information for each starter policy, so users will know exactly what type of starter policy they are purchasing. Join a live demonstration to see how easy it is to use the new Starter Xchange. To learn more about the Starter Xchange, use the step-by-step guide in DataTrace University for a self-service course. The Starter Xchange service is integrated with Title Services. Users have the option to automatically search the Starter Xchange database every time the title chain is searched. The title chain and Starter Xchange link will display in the same Investigative or Order folder, allowing them to print, email and export their entire search package. Description: Starter Xchange is a new service available in Services panel for Arizona, California, Florida, Illinois and Michigan counties. 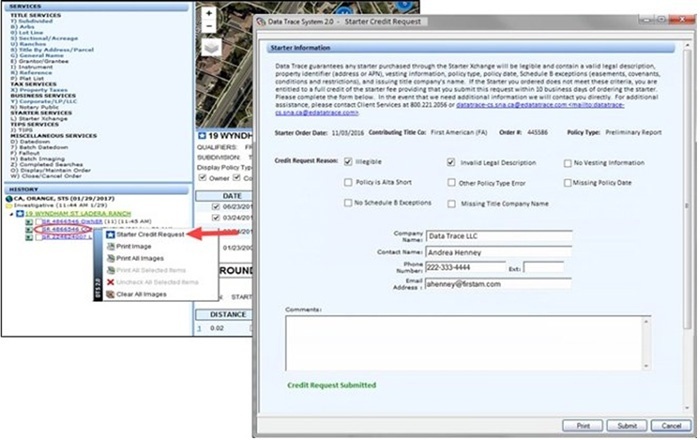 Users can search the Starter Xchange database using APN, Address, Subdivision Name or Title Company and order #. Enter APN, Street Address, Subdivision Name or Title Company/Order # to search for starters for the corresponding property. Select the boundaries to search for surrounding property starters. 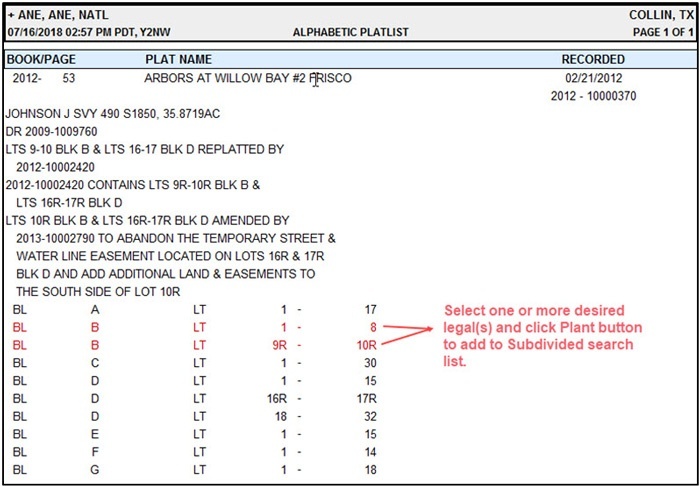 Subdivision - starters that have the same subdivision name as the searched property. · Radius - starters that are located within the selected radius miles from the searched property. Select the desired Policy Types to be returned in the search results and map. Interactive Map: The interactive map highlights searched and surrounding properties that have Starter policies on file. Each starter image that is available for purchase will have key policy information (date, contributing title company, policy type, property information) that will help users to quickly determine which starter they would like to purchase. 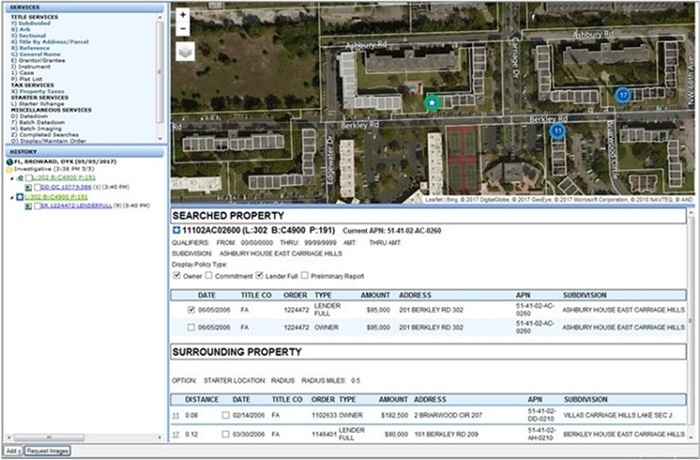 The icons on the map will help users quickly determine if the searched property has a starter policy on file and highlight the surrounding properties that have starters. 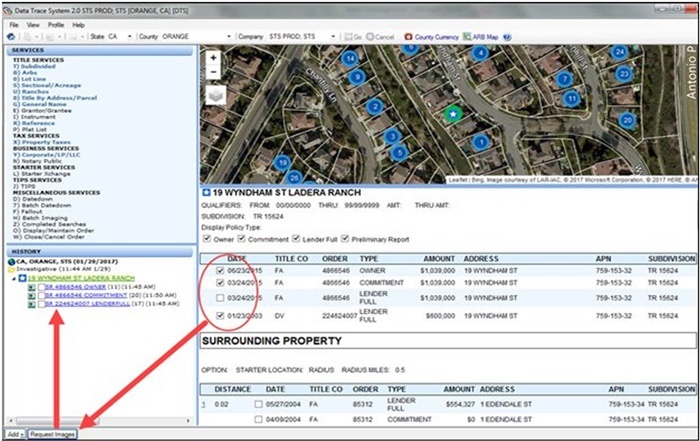 Star icon with green background indicates that one or more starter policies are found for the searched property. Star icon with red background indicates that no starter policies were found for the searched property. 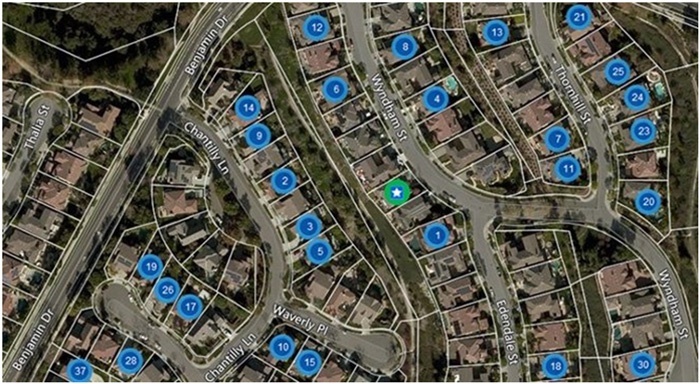 Blue circle icons indicate the surrounding properties that have one or more starter policy available. The circles are numbered based on proximity to the searched property. 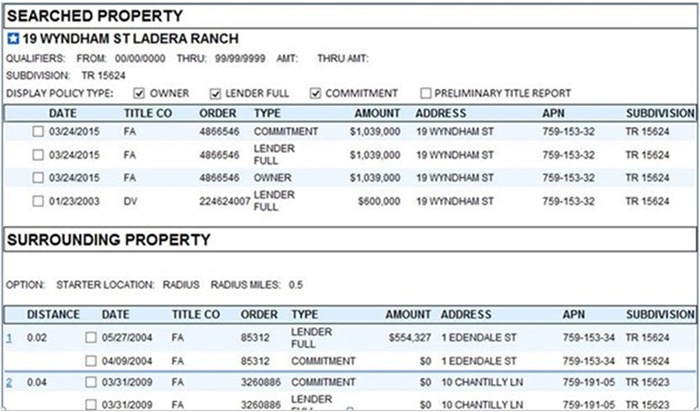 These numbers also correspond with the numbers found in the Starter Information section for surrounding properties. This icon will display in the history panel if a starter image was ordered from a surrounding property. Starter Information: The Starter Information section is broken down into Searched and Surrounding Property. Each starter image that is available for purchase will have key policy information (date, contributing title company, policy type, property information) that will allow users to quickly determine which starter they would like to purchase. The Surrounding Property section also includes the distance (in miles) to the searched property. The Starter Information section cannot be printed, exported or emailed. Only starter images that have been purchased have this functionality. The Display Policy Type checkboxes when checked will display only the selected policy type. These checkboxes are interactive and can be selected to display or unselected to hide policy types in both the Searched Property and Surrounding Property sections. Description: A new Starter Xchange link will be present in the History Panel when a starter search is submitted. It will have a star icon that also displays on the map and the Searched Property section of the Starter Information. The link will match the parameter type (APN, Address, Subdivision Name, Title Company and Order #) used to search for starters. A new surrounding property link will also be present in the History Panel when a starter image is requested from a surrounding property. The surrounding property link will have a blue circle with a lighter blue outline that also displays on the map. The link will show the address of the surrounding property that the starter image was requested from. Description: Users that have access to the Starter Xchange will be able to purchase starter images by clicking on the image tag box for the desired starter(s) and clicking on the Request Images button. The purchased starters will display under the Starter Xchange link in the history panel. These starter images are available for print, export and email. Users that do not have access to the Starter Xchange will be able to view the interactive map and Starter Information, but they will not be able to request images. When they click on the image check box a pop up will display with information on how to request Starter Xchange access. Description: If a purchased starter image does not meet our quality standards, users can submit a Starter Credit Request. To submit a request, right click on the image from the history panel and choose Starter Credit Request. A Starter Credit Request box will display and user can identify the reason for the credit request and click on Submit. This will send the credit request to our image operations team for review. Users will receive an email confirming the receipt of the credit request and the outcome of the operations review. Approved starter credits will appear on the next billing invoice. Description: Users can add the title chain functionality by right clicking on the APN in the Starter Information results to invoke the Quick Search context menu. Description: The Starter Xchange service can be launched automatically from a Title Service input screen when the Starter Xchange checkbox is selected. Users can perform their regular workflow and the Starter Xchange link will be added to the History Panel along with their title chain link. The default setting for the Starter Xchange checkbox is set through User level security. Note: If Tax Search is performed first, the Starter Xchange will be launched when the Title button is selected provided that Starter Xchange setting is checked in User level security. Users can search their chain, request their document images and click on the starter link to purchase their starter images. The title/tax search results, document images, and starter images will all be in the same order or investigative folder and available to print, email or export.